National Council on Radiation Protection and Measurements (NCRP) Report No. 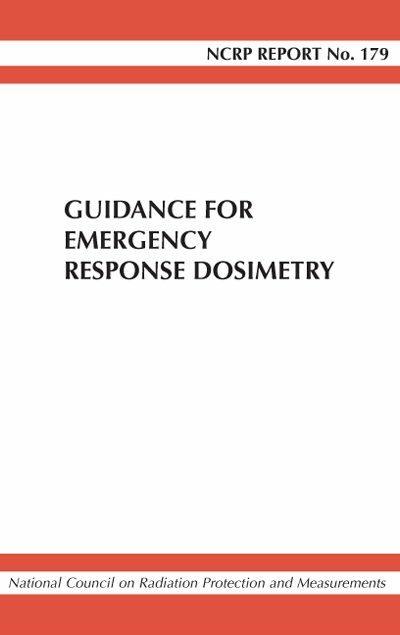 179, Guidance for Emergency Response Dosmetry, complements three previous NCRP publications that provide advice on planning responses to radiological or nuclear terrorism incidents. The Report provides guidance on the accrual and control of radiation dose in the emergency phase of a radiological or nuclear incident and answers three questions: –	With minimal dosimetry resources, how do responders make decisions to control the total dose and associated risk? –	How are doses assigned to responders when not every responder is issued a dosimeter before exposure occurs? – What is the regulatory framework for responders who are not trained as radiation workers? The Report guidance bridges the gap between trained and equipped emergency workers and the remainder community of responders. Emergency workers are defined as those workers who would be called to assist with the response to a radiological or nuclear incident, acknowledging that most emergency workers have jobs that do not routinely expose them to radiation significantly greater than background levels. Emergency workers are not traditional radiation workers (i.e., those whose occupations involve exposure to radiation and who are part of an occupational radiation dose monitoring and protection program). Although the Occupational Safety and Health Administration Standard requires monitoring of emergency workers, there is no other regulation requiring that they be provided dosimetry.